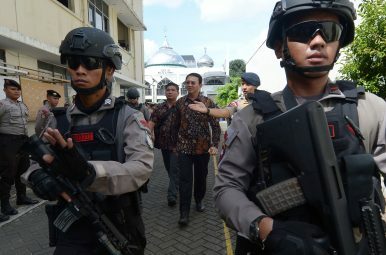 Ahok (C) is escorted by anti-terror policemen as he leaves the North Jakarta court on (December 20, 2016). Ahok’s fate will have huge implications for Indonesia’s future as a pluralistic democracy. Following the aftermath of the December 2 protests, observers inside and outside Indonesia predicted that Jakarta Governor Basuki Tjahaja Purnama, popularly known as Ahok, will be convicted and sentenced to prison for the allegations of blasphemy against him. This case, riven with high political tension and motives, is a very complex one, and precisely its convolutedness gives reason to see different outcomes. There may even be a small but not entirely slim chance that Ahok can be cleared of the blasphemy charges. It is true, as stated by Harsono from his research, that very few people have ever been cleared of charges under the archaic and very problematic blasphemy law (PNPS 1965 and Article 156a of the Penal Code or KUHP). The blasphemy law was the product of a very complex socio-political history in Indonesian state building. It was issued under President Sukarno as a presidential instruction (PNPS 1965) when tensions were high in Indonesia’s political scene between the communist party and social movements against religious groups, in particular Islamic groups such as the Nahdlatul Ulama (NU). The decree was codified into law in 1969 by then-President Suharto. It is, however, used relatively sparingly during the New Order, with the most prominent case being one against Arswendo Atmowiloto, the chief editor of a tabloid. The blasphemy law surprisingly became a favorite tool used by various groups to attack their political and economic opponents during Indonesia’s democratic period. Examples abound, with most prominent ones being cases against Ahmadi and Shiites. In both cases, the victims themselves were convicted and sentenced to prison under the blasphemy law after their communities were attacked and ransacked. Deden Muljana, leader of the Ahmadiyya community in Cikeusik, and Tajul Muluk, leader of the Shiites in Sampang, were each sentenced to prison for for “inciting conflict” (under KUHP 156) and blasphemy (KUHP 156a) for their community’s interpretation of religion, which causes “discordance in society.” Researchers and journalists were quick to find out the political-economic motives behind those physical and legal attacks. There was economic competition between communities and also political motives related to regional elections. What is rather new with the case against Ahok is that this is the first time the law was applied to a high-ranking public official. As a result, the case has caught attention nationally and even internationally. The blasphemy law until recently had always been applied to rather isolated cases regionally as a tool to oppress weaker minority groups or individuals. Thus the blasphemy case against Ahok and its outcome will certainly have serious and vital consequences for Indonesia’s political landscape and democratic future. Former President Abdurrahman Wahid (Gus Dur) and a coalition of civil rights activists, foreseeing such problems, filed a judicial review against the law to the Constitutional Court (MK) in 2009. Hardline groups such as the FPI, which also foresaw the “usefulness” of the law for their gain, amassed public pressure at the MK court hearings. The judges eventually capitulated and decided to keep the law, with stipulations to revise sections that were too broad. The revisions were never done by the DPR (Indonesia’s House of Representatives). Returning to Ahok’s case, President Joko “Jokowi” Widodo certainly knows that, beyond the immense public pressure to convict Ahok, the implications of his case are wide and far-reaching. The attacks fanned by hardline groups are not simply aimed against Ahok as a Christian of Chinese descent. A similar line of attack was also used against Jokowi, a Javanese Muslim, during the 2014 presidential campaign and elections. These attacks will also reverberate beyond the immediate competition for the 2017 Jakarta gubernatorial seat. It is an attack against a progressive style of leadership (represented by Jokowi nationally and Ahok in Jakarta) emphasizing good governance and transparency, which causes unease for groups that previously gained easy access to resources from collusion and nepotism. But more importantly, the momentum is being used by hardliner groups like the FPI and others to co-opt Indonesia’s political Islam away from the moderate and pluralist mainstream Islam represented by NU and Muhammadiyah. The deck certainly seems to be stacked against Ahok. He faces swords from the front, but also potentially from the back as well. All of the parties that support Ahok are of a nationalist stream but also very pragmatic about their own interests, often casting aside ideology and the greater good. They would stand to gain by pushing for an Ahok-Djarot win, but eventually having Ahok convicted. By law Djarot would then be instated as governor, and the coalition parties can select a vice governor of their choice. In spite of this dire situations, though, there have been progressive developments in the past month. Cases of religious intolerance saw a swift response from the president and the government. The “new wave” politicians like Ridwan Kamil, the mayor of Bandung, clearly stand for Indonesia’s pluralism. The clearer and stronger stance by the central government, as well as some regional ones, shows that these politicians know what is at stake for Indonesia’s future. President Jokowi is certainly calculating with one eye on keeping his reelection chances strong for 2019. As the political tensions seem to subside from the December 2 protests, and various events throughout the nation, from religious intolerance to terrorist acts, emerge, there are signs that the public and politicians begin to differentiate the weeds from the grass. Hardliners that had managed for a period to co-opt Indonesia’s political Islam may be hopefully pushed to the fringes of Indonesia’s political scene once again. If this trend continues and the president and the public see that the primordial hardline groups do not represent the majority, Ahok can escape conviction. It is a small chance but not vanishingly small. Tobias Basuki is a researcher at the Center for Strategic and International Studies (CSIS), Jakarta. Stop Calling Indonesia a Role Model. It's Stopped Being One.Ahok Is in Jail. Where Does Indonesia Go From Here?Packed Lunch Protesters: Outrage for Hire in IndonesiaWhat Does Indonesia’s New Cabinet Reshuffle Mean for Jokowi’s Future?What Did Indonesia’s Anti-Ahok Reunion Rally Reveal?